Offering a welcome as warm as the sun, La Pirogue typifies the Mauritian experience: deeply enigmatic, exquisitely tranquil, delightfully friendly and filled with endless fun. 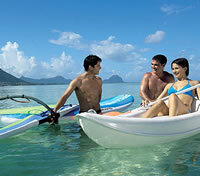 La Pirogue is true Mauritius: blues and greens and golds and pale shades of white, splashed with tropical colour. It is open skies and flowing water, tall swaying palms and silky sand. pleasure and star-filled skies, garnished with attentiveness and generosity. areas and intimate spots. It is everything a family could wish for; everything a couple could dream of. La Pirogue is an ode to the island's fishing culture, enhanced by the rustic charm of volcanic rock, warm wood, thatch, coral and vanilla. It is unique in its style, design and décor. and royal suites are both spacious and deeply charming; both romantic and family-friendly. and all of the special touches you'd never anticipate, this is an exceptional resort. 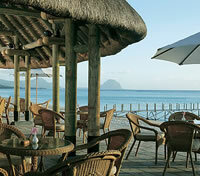 La Pirogue is multi-themed buffets, romantic candlelit evenings and every delicious detail in between. lunch buffet, featuring English, Creole, Mauritian or Indian delicacies. And as the stars come out, look over the garden, the pool or one of several themed live cooking stations as you enjoy barbeque, salads, pasta, pizza, teppanyaki and dessert. Thatches seats 450 people. 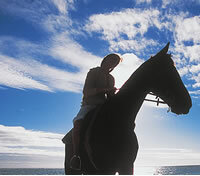 Or, for a fee, enjoy horse-riding, undersea walks, big game fishing, parasailing, banana boat and supertube rides, scuba diving, submarine dives or giant catamaran outings. Have you ever dreamed of a beautiful wedding or romantic honeymoon on the world's dreamiest island? Have you ever wished someone else would organise it, so you could just focus on being in love? If an incredible beach wedding is your dream, World Leisure Holidays can arrange every aspect: hair and makeup to video and photographs, colour scheme to catering, bouquets and buttonholes to ceremony and reception, legalities to live band. All you have to do is look beautiful. In our portfolio of exceptional wedding packages, we have just what you're looking for. You can also design your own day from our menu of options. Feel free to incorporate meaningful religious elements or to choose a simple non-denominational beach ceremony. Whatever your dream, we'll create it. There are delightful finishing touches and enhancements to add - like pre-wedding bridal pampering for you and your retinue - to ensure that your day is as special as you have always imagined. We can even arrange a special laundry/pressing service for the dress and suit. You should know that many of the brides who've had Mauritian weddings have considered them to be one of the most beautiful and stress-free experiences of their lives - just as they should be. The natural warmth and hospitality of the locals also mean that you can ask for anything and they will go out of their way to accommodate you. 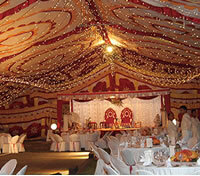 It's all about making your big day as special as you always dreamed. World Leisure Holidays prides itself on creating honeymoons beyond your wildest dreams. Whether you marry on the silky beach or fly in from your wedding reception elsewhere, you'll be made to feel like absolute royalty. Our vast collection of luxurious resorts offers everything you could dream of. Water sports. Land sports. Exciting excursions. Health and beauty. Divine dinners. Carefree picnics. Memorable moments. 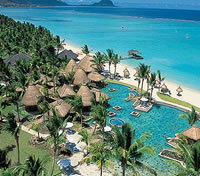 A honeymoon in Mauritius means magic every day. It means romantic candlelit evenings and smiles and dancing and joy and music and pleasure. 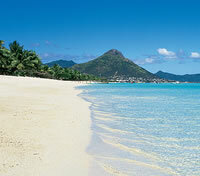 It means miles of unspoilt beach to stroll, endless tranquil lagoons to bathe in. Whatever you want, just tell us about it and we'll gladly create it for you. Le Touessrok Golf Course and Tamarina Golf Club. 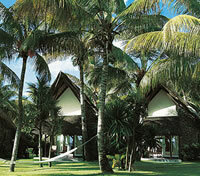 Golf Academy are accessible by boat from Le Touessrok, on the east coast of Mauritius. crosses the Rempart River, offering magnificent views of Mount Rempart and resembling a wide-open African savannah. Tamarina Golf Club has a comprehensively equipped clubhouse, delightful restaurant, practice range, putting green, chipping area and PGA Professional lessons. scuba diving initiation, undersea walks and parasailing - under the constant watchful eye of professionally trained staff. There is also a complimentary welcome pack and Club card. interact, play the latest computer games and enjoy music in a safe and fun environment. 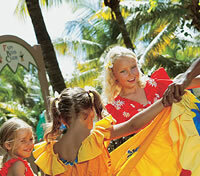 lagoon cruises, island picnics and much more. No more rolling of the eyes - they'll be waving you goodbye.